A talk given in the presence of the Metropolitan Filaret (Vachromeev), of Minsk, at the occasion of the Conference organized by the Foundation “Russia Christiana”, of Seriate, Bergamo (Italy), together with the Synodal Theological Commission of the Moscow Patriarchate, on the topic: “Orthodox Theological Commission of the Century. History of a Meeting”, on 30th-31th October 2004. Tittle: Cuaderno 1. 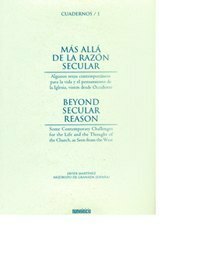 “BEYOND SECULAR REASON” Some Contemporary Challenges for the Life and the Thought of the Church, as Seen from the West.